When changing methods or fabric widths, check other settings for changes in available options. 5" 7½" 10" 12½" 15" 17½" 20" 22½" 25" 27½" 30" 32½" 35"
Cut 3 strips 2½ inches wide. Sub cut into 45 squares. Cut 8 strips 2½ inches wide. Sub cut into 36 squares and 108 half square triangles using a half square triangle ruler. Match 1 strip of each fabric right sides together. 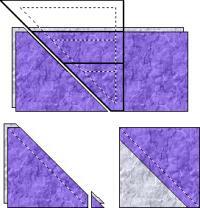 Using a side right triangle ruler, cut half square triangles. Move ruler upside down for next cut when necessary. Sew ¼ inch seam on long side of triangle pair. Press seam to one side. 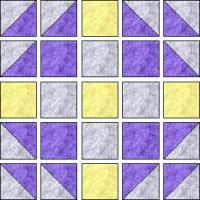 Make 108 half square triangle units with fabric 2 & 3. Layout each Mrs Keller's Nine Patch block units as shown and chain piece together first rows, then columns using a ¼ inch seam.